High winds have created some power outages and damage in parts of the region. WBFO's senior reporter Eileen Buckley says winds with gusts of up to 60-miles an hour have been whipping around the area Friday morning. Tree damage Friday morning along Westchester Blvd. in Tonawanda. WBFO's senior reporter Eileen Buckley says winds with gusts of up to 60-miles an hour have been whipping around the area. It was like a wind tunnel driving along Pearl Street in downtown Buffalo Friday morning. Strong wind gusts pushed debris into the air. There were pieces of cardboard and garbage dancing along the city streets. 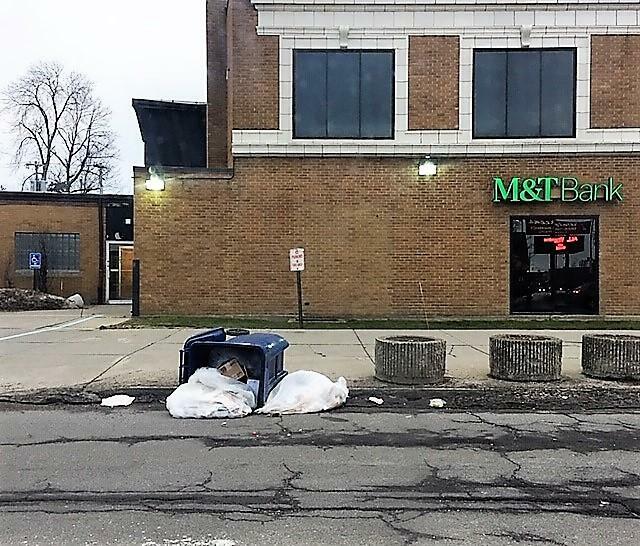 Winds knocked over garbage totes outside of M&T Bank branch at Parkside & Hertel in north Buffalo. Across the region, both National Grid and New York State Electric & Gas said initially there were more than 4,700 customers are without services across parts of Erie, Niagara, Genesee and Orleans counties. In the metro Buffalo there are garbage totes knocked over, tree limbs and other damage. At Military Road and Sheridan Drive in Tonawanda there is some partial roof damage to a business and there is also some tree damage along Westchester Boulvard in Tonawanda. Military Road & Sherdian Drive in Tonawanda, winds caused some partial roof damage. A high wind warning will remain in effect until 5 p.m. Friday across the Western New York region.